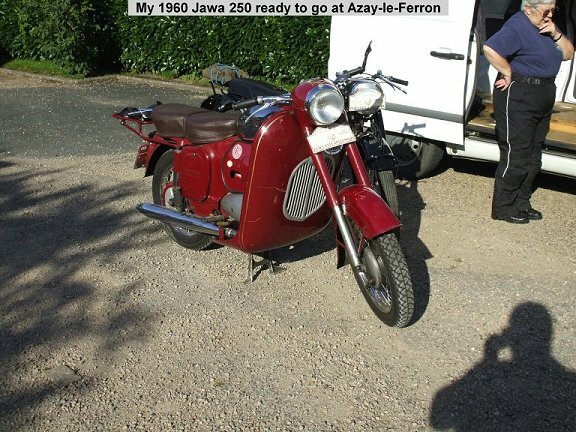 Last year (2006) I forgot that Jawa/CZ day was on the 9th July but actually rode my 1936 CZ 175 in a rally on the 8th. I vowed that this year I would not forget Jawa/CZ Day and entered my 1960 Jawa 250 for both days of the same rally on the 7th and 8th July. 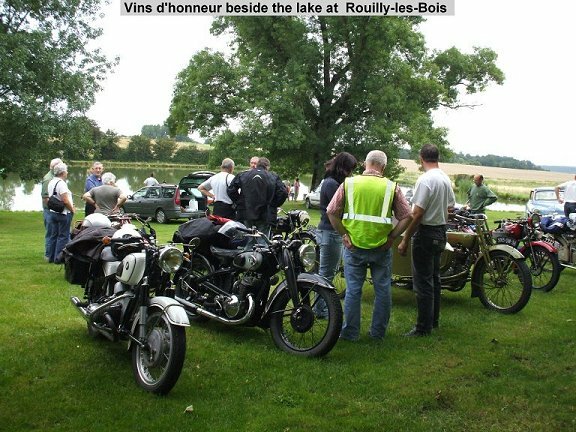 The rally in question is the Randonnée en Brenne, organised by the Retro Club Ferronnais, and which is an event for pre-1960 vintage machines. The route takes a gentle wander through the lanes of the ‘Land of a Thousand Lakes’, which is the generic name for the Parc Naturelle du Brenne in Central France. It actually strays out of the Brenne for some of it’s 200 kilometers, and is very effectively controlled throughout by travelling marshals who shepherd the participants through road junctions without having to stop. As usual I was accompanied on the run by my pal Jeff Bishop and his partner Sandra Vassie on a 1959 Velocette MAC - not a Czech bike I know, but you can‘t have Utopia all the time can you? 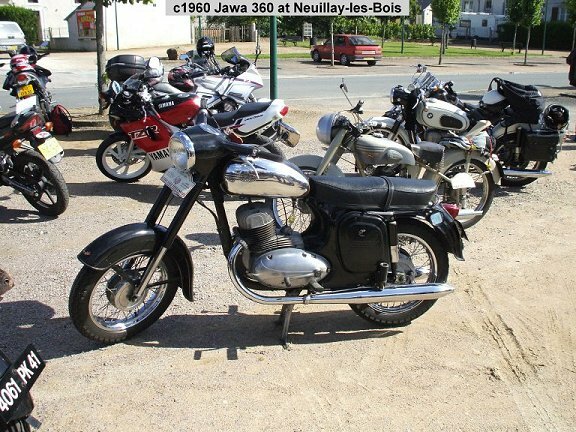 There was another Jawa running, a model 360 of around 1960, but I omitted to discover the rider’s name. Suffice it to say that he was a Frenchman and a Jawa/CZ lover, and until I told him, had been unaware of the significance of the 8th July. The Saturday run was from Azay-le-Ferron in the west of the department of Indre, to Issoudun which is north-east of the town of Châteauroux, and followed a curved route skirting south of the town. Sunday’s run was the whole thing in reverse but passing around the north of Châteauroux. Being totally averse to overnight kipping in sleeping bags, we had devised this cunning plan which entailed the three of us leaving the pack shortly after lunch on the first day and going back to my house where we would sleep. On Sunday morning, the intention was to ride north and rejoin the peloton somewhere en route before lunch. Saturday dawned bright and sunny and about 35 assorted motorbikes plus the obligatory antique Simca car (which always takes part) set off at 08:30 on the dot (i.e. 09:15) more or less in convoy with the usual gang of travelling marshals scaring the living daylights out of many of the vintage motorbike riders by whizzing past the peloton at record-breaking speeds as they went ahead to man the next few junctions. I was particularly keen to observe the performance of one guy who enters every year on a 1926-ish Motobécane MB1, an example of which I am currently restoring. The MB1 is a 175cc 2-stroke with a bacon slicer flywheel, pedals, no clutch, no gears, belt driven and iffy brakes - in fact it‘s no more or less than a heavy motorised bicycle. I was pleased to note that the only time he used the pedals was to start the engine. It seemed to sail up hills quite easily which was greatly encouraging for me and my aversion to pedal assistance. Unfortunately Alain had a magneto drive problem and ended up on the backup trailer. Meanwhile, my Jawa purred on serenely just as it used to when I last owned it back in 1998. Prior to my move to France, I had sold the bike to an acquaintance in the UK and last year - after a bit of persuasion - he sold it back to me, having only covered a mere 85 miles on it in the interim. So now it’s back in my stable having been re-registered in France. After about an hour and a half of riding, we stopped at the village of Neuillay-les-Bois for a drink and a rest. 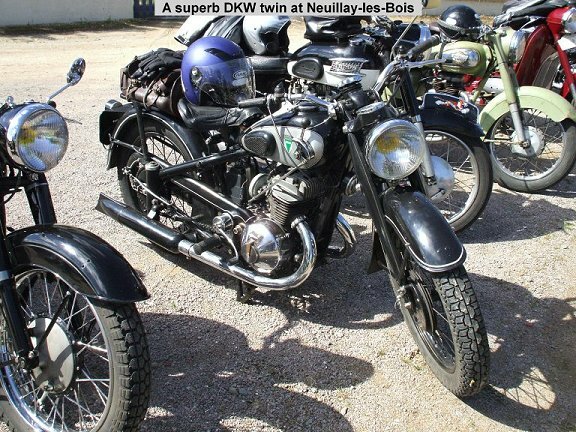 This gave everyone a chance to stretch their legs and get a closer look at the great variety of machines that were taking part; Rovin, Ratier, DKW, Sarolea, Triumph, Motobécane, Terrot, etc. - and the sun grew hotter - phew! After this stop, the next scheduled halt was for lunch at a village called Arthon, and it was here that we arrived about half-an-hour early despite the whole field having been halted about a kilometer beforehand to waste time and regroup. We arrived at the restaurant and parked up in the shade beneath the trees on the opposite side of the road, all ready to do justice to the meal. But no - before we could get to the food, we all had to troop round to the back of the Mairie and join the Mayor of Arthon in drinks and nibbles whilst he made a speech of welcome. We eventually did get to consume a pleasant four-course lunch and then lay around afterwards in the shade of the trees opposite. All very restful - and the sun got even hotter! We resumed our ride in due course and shortly afterwards we three peeled off at a large roundabout with about a 40-minute ride to my home in Gargilesse - much to the horror of one lady marshal who thought we'd mistakenly taken the wrong turn off the roundabout. She was beside herself with alarm with much arm-waving and shouting, but I just gave her the thumbs up sign and we headed for home only stopping once en route for a cooling pint of beer at Badecon-le-Pin. Then I devised yet another cunning plan - why not put both bikes on a trailer, then next day everyone including my wife Erica and Jeff’s uncle John, could travel north together to rejoin the run? With only Jeff and myself being car drivers we would each take it in turns to drive my wagon or ride our respective motorbikes. Great idea what? So we loaded the trailer ready to move off the next morning. Now I must tell you that I had changed my car a week or two earlier, and the new vehicle came with towing kit already installed thereby saving me the problem of having to get a tow bar fitted and wired up. Early-ish Sunday morning I hitched up the trailer and then attempted to connect the electrics. Whoops - big problem! All the trailers and caravans I've ever owned have had 7-pin plugs. My cars have only ever had 7-pin sockets (times two if a caravan was involved). It was at that point I discovered that my car is fitted with a 13-pin socket (which, as I subsequently discovered, is the current norm for caravan connections). So plan A was instantly aborted, the motorbikes were taken off the trailer, and we set off with Jeff following on his Velocette. I consoled myself in the belief that I would still get a bit of a ride on the Velocette later, but when I discovered that I was not insured to ride it, I became resigned to being a taxi driver for the day. But I nevertheless enjoyed it. We eventually linked up with the riders who predictably were running at least half-an-hour behind schedule having made an ‘Educational Visit’ to a brewery en route. Another very pleasant lunch was taken at Rouilly-les-Bois preceded by a drinks stop - un vin d’honneur - by a lake just beforehand. Interestingly when you enter for this event your signature on the entry form commits you to respect the laws of the road, particularly with regard to consumption of alcohol. This being France, you soon realise that this particular law commands very little respect. In fact one regular English rider tends to take things to extremes. He just loves the wine and the French and makes sure he gets plenty of both. So after the lunch stop the marshals quietly put his bike on the breakdown trailer and told him to ride in the tow car. Soon the peloton was clacking and whirring it's way through the back-lanes of the Brenne stopping once for a consolidation rest at a crossroads (which soon resembled a parking lot obliging bona fide road users to thread their way through a mass of motorbikes and riders. Then we set off again stopping for more drinks at a village called Arpheuilles. Then we rolled on to the finish at Azay-le-Ferron where everyone received a souvenir award and a few got special trophies of the plastic variety usually sold in lots of six at the nearest supermarket. Predictably one went to our English hero - the French just love the man and he always gets a trophy. But it's all good fun really and we await next year’s run with trepidation. I’ll be there for sure!